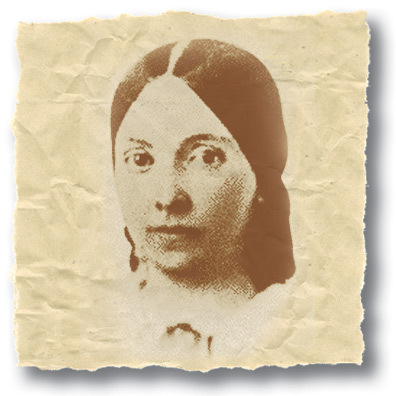 Rebecca Bruce was the intelligent, tender and lovable 18-year-old sister of Sanders Bruce when his 23-year-old business partner, John Hunt Morgan swept her off her feet and proposed marriage. They had been married for five years when, in 1853 Becky gave birth to a stillborn son. Soon after that, pain and soreness persisted in one of her legs. Morgan took her to doctors all over the country, from New Orleans to Hot Springs, Arkansas in search of a cure, but to no avail. She apparently had septic thrombophlebitis, an infection of a blood clot in a leg vein, which caused the arteries supplying blood to that leg to shut down. In those days, the malady was called "white leg" or "milk leg" and there was no known cure. Morgan grew more and more frustrated and saddened at not being able to help ease his wife's pain. In fact, Becky's medical condition began to deteriorate, and in January of 1861, her leg had to be amputated. After years of suffering, Rebecca Bruce Morgan died on July 21, 1861, the same day as the first battle of Bull Run. To hear the song, click here. © 2019 Electric Quilt Music. All rights reserved.